Meg Chester goes ‘picnicking at Pemberley’ when she samples outdoor theatre at the stunning location that is National Trust property Erddig, near Wrexham. All photos by Meg Chester. Call me old before my time, but I love a good National Trust property. Whilst growing up, my family and I spent many a Sunday afternoon at Erddig or Chirk Castle, exploring the house and grounds and more often than not ending up in the teashop. There is something so dreamy and charming about waltzing through rose gardens and mazes, across courtyards and beside lakes. Walking through room after room of great old houses, my shoes clip-clopping against the unending passageway floors, rarely failed to set my childhood imagination alight. 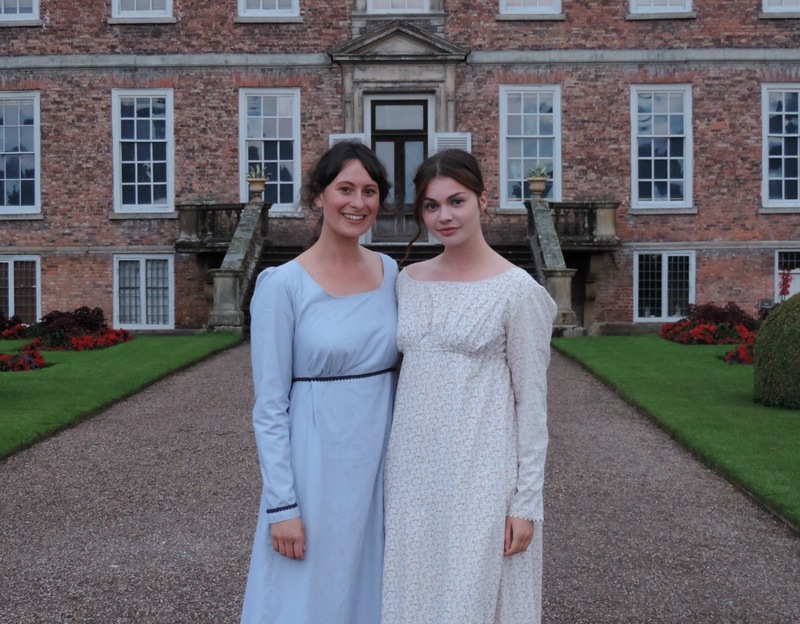 On Saturday evening, it was as though all these historical fantasies sprang from my imagination and were given human form and lines to speak; I went to watch Chapterhouse Theatre Company’s open air performance of Pride and Prejudice at Erddig. There is something so dreamy and charming about waltzing through rose gardens and mazes, across courtyards and beside lakes. Grey clouds gathered and the changeable sky teased us with sporadic rain showers. As we made our way to Erddig’s walled rose garden – a secluded spot in which the performance was taking place – the wonderfully welcoming staff and friendly volunteers assured us that the rain would soon ‘turn off’. And sure enough, it did. At one point there was even a rainbow to top off the picture-perfect scene. Though our international identity is perhaps somewhat uncertain at the moment, Saturday night assured me of what we Brits can firmly hold on to: our ability to picnic and our vast array of raincoats are things to be proud of. A friend recently reminded me that Britain also has a rich track record of writers. And so, in the most quintessential and fitting way I can imagine, we celebrated one of the nation’s most-loved authors – the performance of Jane Austen’s Pride and Prejudice began. Adapted by Laura Turner and directed by Antony Law, the play was simply brilliant. With a cast of only eight, the actors certainly had their work cut out. They not only took on the roles of multiple characters, but also doubled, tripled, quadrupled up as programme sellers, stage managers and even interval raffle callers. One of the prizes up for grabs was a kiss from Mr Darcy, I might add. Mr Collins – fantastically played by Alex Bird – needed only to walk onto the stage, and had the audience giggling at his social awkwardness. Minutes later, however, he would stride into a scene as Mr Wickham and have us all booing under our breath. In fact, every single cast member nailed their characters brilliantly and worked together to do credit to the literary masterpiece. The performance was soaked in Austen’s gentle humour, classic lines, beautiful costumes and so much fun. The set was beautifully simple, staying the same throughout the show, and yet even so it managed to transport us to the stately homes of Pemberley and Netherfield, as well as the Bennett’s home at Longbourn. The design cleverly created two rooms, three houses and various regions of the country from a couple of sets of windows, some drapes and a few bits and bobs of furniture. The rather alfresco exposure to the elements and the fact that the play took place nestled in the shadow of a great manor house no doubt helped to captivate us as an audience. It was like watching Romeo and Juliet in Verona, Grease at a drive-in movie theatre or Charlie and the Chocolate Factory in Thorntons – the story of Pride and Prejudice seemed rather at home in the beautiful gardens of Erddig. Thank you so much to Chapterhouse and the National Trust for such a lovely evening out. The intimacy of the event gave the performance a refreshing authenticity, which warmed the heart and made it feel so good to be alive. It is of no surprise to me that the show was a complete and utter sell-out. Be sure to keep your eyes peeled for other Chapterhouse performances in the future, and why not embrace what we have left of the summer by popping down the road to Erddig for one of their Saturday Lates? On 19 and 26 August, the gardens are open into the summer evenings, with live jazz music and sounds of the Mediterranean. Surely, it is a truth universally acknowledged that a nicer way to spend an evening would be almost impossible to find.